BEIJING -- A ranking official at China's foreign ministry recently visited Pyongyang, a source in Beijing said Tuesday, stoking further speculation about Chinese President Xi Jinping's imminent visit to North Korea. 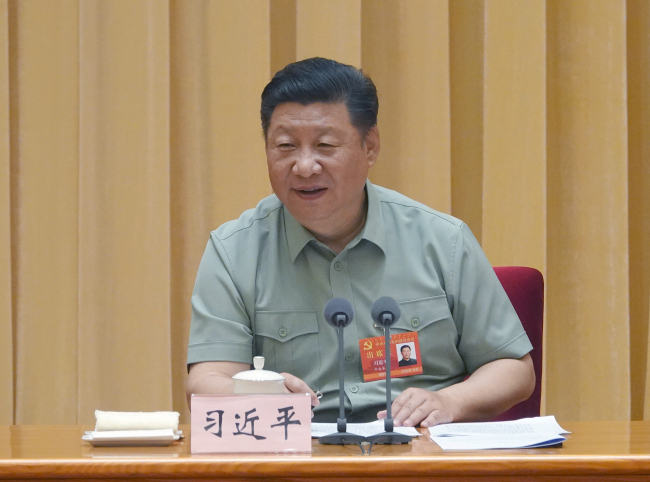 Recent media reports said that Xi plans to visit North Korea around Sept. 9 to attend a ceremony marking the communist ally's 70th founding anniversary. According to the source, the Chinese official with a rank of deputy assistant minister recently contacted North Korean officials in Pyongyang. "It has been known that a Chinese official entered North Korea. The visit drew attention due to its sensitive timing," the source said. A Singaporean newspaper reported last week that Xi will visit Pyongyang in early September at the invitation of North Korean leader Kim Jong-un to celebrate the North's 70th founding anniversary. China's foreign ministry neither confirmed nor denied the report, only stressing friendship between Beijing and Pyongyang. On Aug. 14, a Chinese youth choir visited North Korea for a performance in Pyongyang, while China's ambassador to the North, Li Jinjun, stressed bilateral cooperation and friendship during his tour of a North Korean province on Aug. 10-11. Watchers here raise speculation that Xi may travel to Pyongyang after presiding over a China-Africa cooperation forum summit in Beijing on Sept. 3-4. They say Xi's Pyongyang visit, if realized, would come shortly before the Sept. 9 founding anniversary, as the Chinese leader may refrain from standing next to Kim during the North's celebratory military parade on the anniversary day. The Chinese president plans to visit Russia's Vladivostok on Sept. 11-13 to attend the Eastern Economic Forum, while South Korean President Moon Jae-in plans to hold summit talks with Kim in Pyongyang in September. "Considering Xi's schedule and the North's circumstances, early September is seen as the right time for his Pyongyang trip," another source said.